Arguably the most exciting recent development in astronomy was 2016's announcement of the discovery of gravitational waves, waves that literally ripple the shape of space itself, created by violent events like black holes colliding. But every gravitational wave discovery had always been done with only two detectors, meaning that scientists only knew what caused the waves—but couldn’t really figure out where in the sky they came from. As you may have read, another gravitational wave detector called Virgo joined the two operational LIGO experiments to better measure the waves. Today, scientists from both collaborations are announcing the first gravitational wave event to include both LIGO and Virgo observations at a press conference (watch it live here) in Turin, Italy. It’s not a confirmation of the “new kind of gravitational wave” rumors you might have seen, but it’s definitely an important milestone in gravitational wave astronomy. “We were so happy, I have to tell you. We celebrated,” Louisiana State University physicist (and former LIGO Scientific Collaboration spokesperson) Gabriela González told Gizmodo. “Virgo joined this run on August first... but we didn’t think we’d see anything over that period of time.” Then, on August 14th, the waves came in. Virgo’s addition is a big deal, mainly so scientists can point their telescopes to the source of the gravitational waves as soon as they hit. “The main advantage of knowing the direction is that you can take a telescope in that direction and see if anything else is coming from the source,” said Imre Bartos, assistant professor at the University of Florda. Some potential gravitational wave-producing sources like colliding neutron stars might come with a light wave counterpart observable by telescopes. The newest gravitational waves came from two black holes, one 31 times the mass of the sun and the other 25 times the mass of the sun, colliding to form a black hole 53 times the mass of the sun according to a LIGO press release. That means an amount of mass three times that of our sun turned into energy powering the waves. 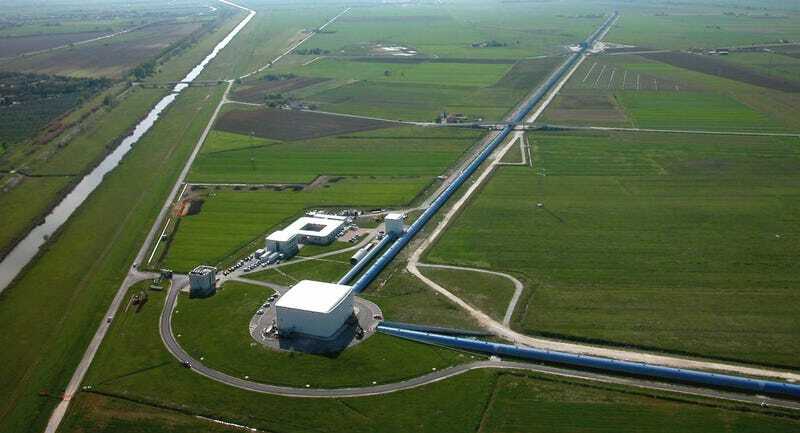 Gravitational wave detectors are enormous, several-kilometer-long L-shaped tubes with laser light split, sent down either end, then joined up in a detector. When gravitational waves pass by, the laser beams move in and out of phase with each other just a tiny amount, creating a waveform that can be analyzed to understand the properties of the black holes and the waves. 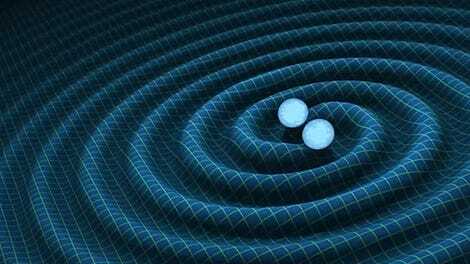 Originally, there were only two detectors sensitive to the kinds of gravitational waves hitting the Earth, a Laser Interferometric Gravitational Wave Observatory (LIGO) in Washington State and one in Louisiana. Having only two detectors meant there was lots of uncertainty in where a wave came from—the source could have come from pretty much anywhere inside a banana shape that made up about 1/40th of the area covered by the night sky, Imre Bartos, assistant professor at the University of Florida told Gizmodo. Think about trying to listen to a sound with your eyes closed—you can kind of guess but not exactly pinpoint where the sound came from. Adding the new observatory in Italy, Virgo, was like adding a third ear or opening an eye. Virgo decreased the size of the uncertainty by ten times over LIGO data alone, according to the press release. The LIGO and Virgo scientists made their announcement in front of the G7 Science Ministers to show off the international effort.